But unquestionably the greatest resource that gave me guidance was an amazing Alley Cat Scratch website with an enormous amount of detail and advice about ever aspect of the Lord of the Rings costumes. From costume sketches, patterns, photos of the original costumes, discussions of the fabric and construction used by the production company…. this was an invaluable resource for making Frodo. 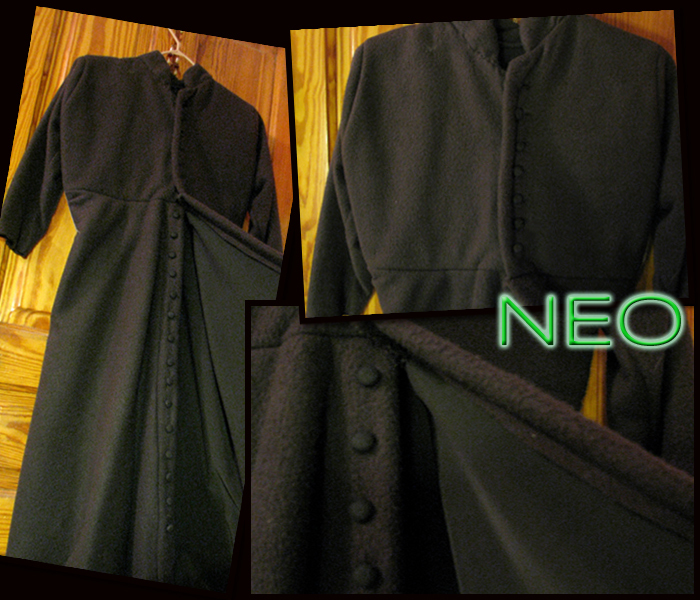 We were quite taken with the Matrix series, so naturally my son wanted to be Neo. The first step was to get a “Neo” haircut. Although Neo was armed and dangerous by the end of the Matrix, we agreed that any armaments would be inappropriate for inclusion in a school setting after the events of Columbine. And isn’t the underlying theme of the Matrix trilogy that guns are merely props; the real power is from within? I grew up watching a black & white Zorro on television. But as much as I loved Guy Williams, the Antonio Banderas’ Zorro was the one to emulate. 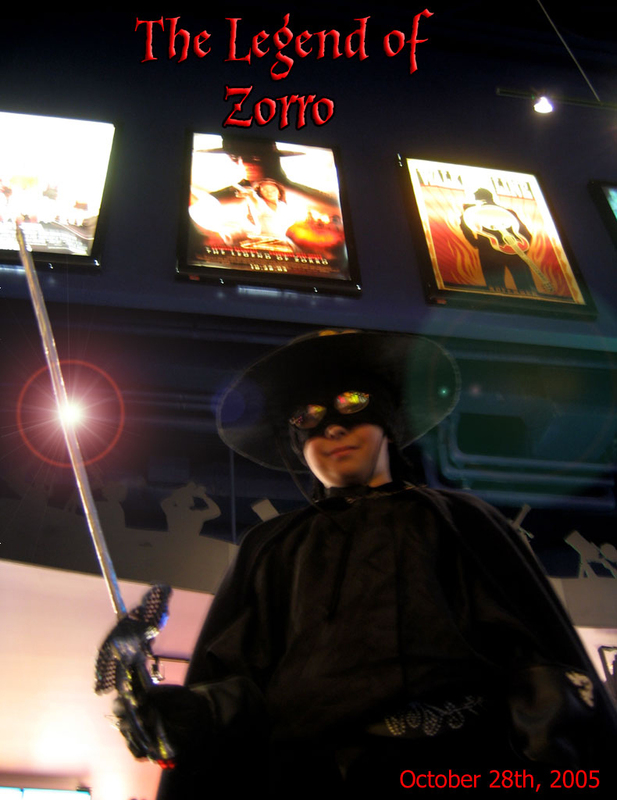 This costume did double duty, as Hallowe’en coincided with the theatrical release of “The Legend of Zorro” which we thoroughly enjoyed. Johnny Depp deserved his Oscar for Captain Jack in the first (and only good) Pirates of the Caribbean movie. The richness of the character inspired my son to revisit the world of pirates. This costume was another major undertaking, not least because I was emboldened to do far more original sewing than alteration work. It was gratifying that after Hallowe’en my son wore the pirate shirt to school more than once as part of his wardrobe. 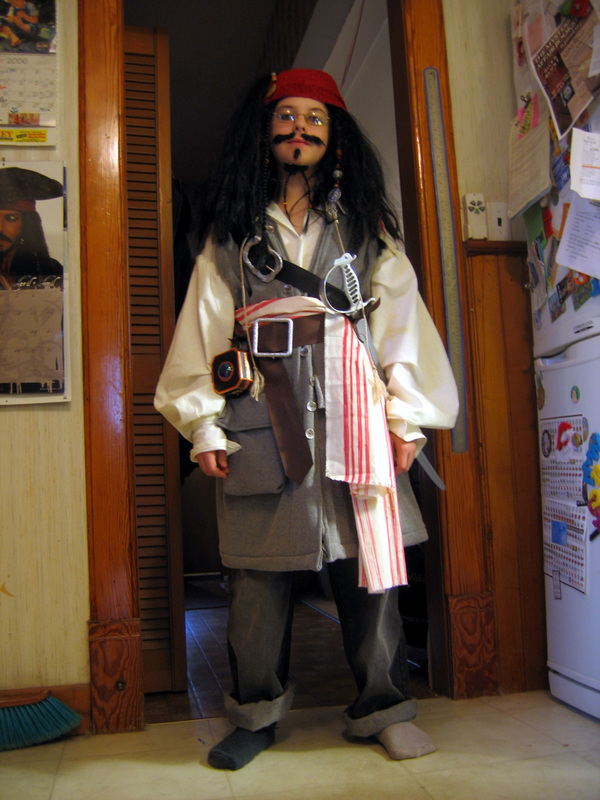 This costume also required even more in the way of accoutrements than our first pirate outing had. We began with a beige trench coat, but extra pockets had to be added to the interior so my young Harpo could secrete various bits of paraphernalia, magic tricks, a giggle stick and most important, Harpo’s signature horn. 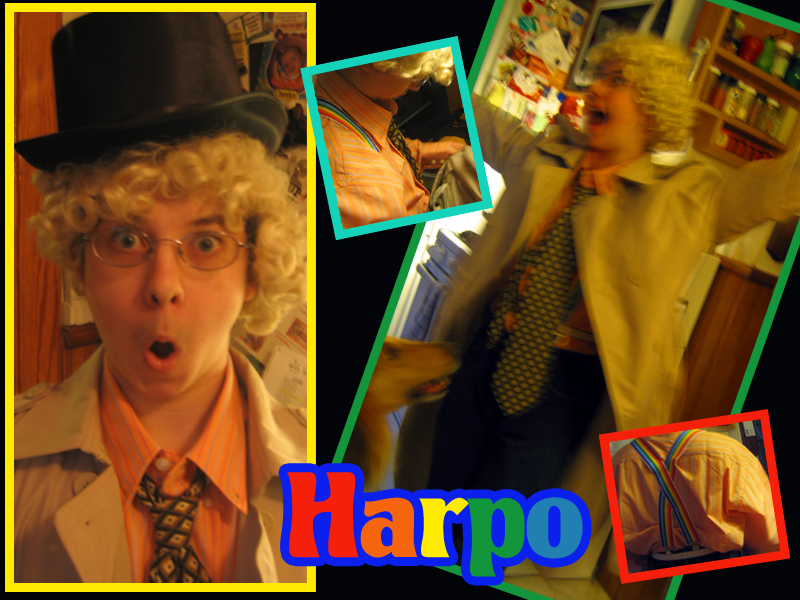 Even in black and white, it was clear that Harpo’s wardrobe was always bright, so we searched for the loudest shirt, and brightest suspenders we could find. We topped it off with a nice blond wig and top hat from a local costume shop. In keeping with the characterization, my son wore the costume to high school, where he didn’t speak a word all day, only punctuating his non-verbal communications with honks on the horn. He was a little disappointed that only a few of the teachers even knew who the Marx Brothers were. 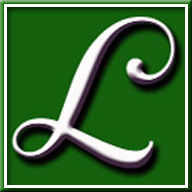 This article completes my overview of the costumes I’ve made for my son. I expect to devote entire articles to the three most elaborate costumes, for Frodo, Zorro and Captain Jack. I am pleased to see that my son has taken to making his own costumes these days.